Le’Veon Bell finally has a landing spot, and it’s with the New York Jets after the running back inked a four-year deal that will make him the second-highest-paid running back in the league at an average of $13.125 million per year. Thus ends the saga that saw Bell infamously sit out the entire 2018 season leaving many a fantasy football owner holding the bag. In New York, Bell steps into a new-look Jets offense with Adam Gase at the helm. The Jets currently have Isaiah Crowell and the young duo of Elijah McGuire and Trenton Cannon on the depth chart. There have been rumblings that Crowell will be released, but that has yet to officially happen. McGuire and Cannon have both flashed upside in their pro careers, but neither is a threat to Bell’s workload. That means a three-down workload is likely for Bell, but it isn’t fair to simply expect the same production as we saw in Pittsburgh. Gase’s Dolphins ran the fewest offensive plays last season, with just 878. The Jets weren’t far ahead at 971. Gase ran the ball on just over 42% of the time, which was nearly identical to the Jets’ run/pass ratio. While there is some optimism surrounding the Jets offense, it’s unlikely we see a significant jump in scrimmage plays from last season. That means 400 is a fair estimate for Jets rushing attempts. A 70% share would put Bell at just over 280 carries for the season. He averages 4.3 yards per attempt over his career but averaged just 4.0 when we last saw him in 2017. Even at the low end of his range, we’re looking at 1,120 rushing yards. Given his career touchdown rate, we can conservatively project Bell for 7.3 rushing scores. Of course, the beauty to Bell for fantasy purposes has always been his ability as a receiver. He saw an 18% target share with the Steelers in 2017 and was in that range throughout his tenure with the team. That usage would actually align with how Gase deployed Kenyan Drake last season, as Drake saw 16% of the Dolphins’ targets. Splitting the difference and giving Bell a 17% share would translate to just over 89 targets. Bell has caught 79.5% of his targets as a pro, which means 70 catches would be a fair expectation on that workload. He’s averaged 7.6 yards per catch over his last three seasons, which projects out to 535 yards. And we can reasonably project 1.5 receiving scores given his historic production. Put that all together, and you have a projection of just over 288 PPR points. While that wouldn’t have put Bell in elite fantasy territory, that sort of production would have been good enough for sixth among running backs last season. Given this expectation, it’s completely fair to view Bell as the No. 6 option at the position. That would place him at the top of the second tier of running backs in the same range as Melvin Gordon and former teammate James Conner. Of course, we’d be remiss if we didn’t mention Bell’s long-term fantasy outlook. This is his age-27 season, which is typically when we start to see signs of decline in running backs. While it’s true that he saved himself a season of NFL wear and tear last year, he’s also had one of the heaviest workloads we’ve seen at the position over the last decade. If you own Bell in dynasty leagues, now is the time to unload. 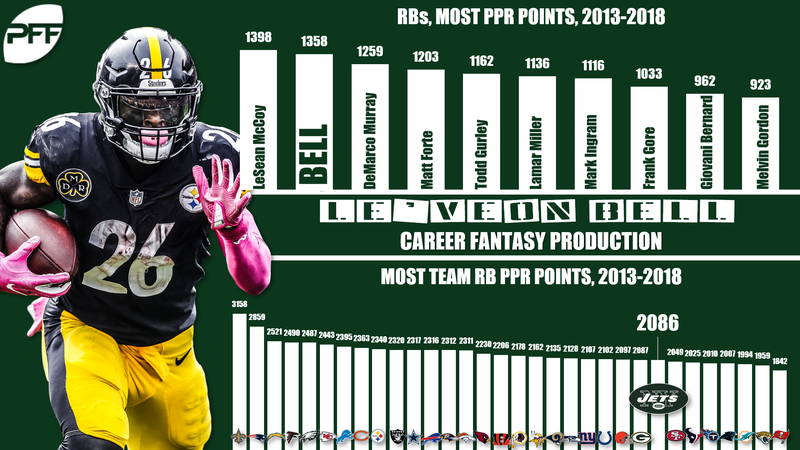 Bell is still a strong bet to produce RB1 numbers in 2019, but his long-term arrow is pointing down.